Aims Molecular genetic analysis is now a routine ancillary diagnostic modality to the histopathological diagnosis of soft-tissue neoplasms, many of which harbour characteristic gene fusions detectable by reverse transcription-PCR (RT-PCR). As the final diagnosis often depends on the molecular result, it is important to obtain the optimal yield of patient RNA. Methods We assessed the most reliable method of providing formalin-fixed, paraffin-embedded material for optimal RNA yield by comparing three consecutive periods in which different preparations (5×10 μm scrolls, 5×5 μm sections and 1×10 μm sections) were used for RNA extraction for RT-PCR, with its technical success rate. Results For ‘2011’, ‘2012’ and ‘2013’, RT-PCR technical failure rates were 13.4%, 4.4% and 7.9%, respectively. The percentage of failed referral cases was 71.4%, 85.7% and 31.3%, and the proportion of core biopsy to excision specimens was 3:15, 2:5 and 13:3. Conclusions This study shows that the effectiveness of RNA extraction and purification is dependent on both specimen type and the tissue sectioning strategy. The failure rate has improved over recent years, particularly for large specimens as large numbers of thick 10 μm scrolls can saturate RNA extraction columns. In contrast, recent technical fails are more frequent in core biopsies, where 1×10 μm sections are insufficient for adequate RNA extraction. While previous technical fails occurred mostly in referred cases, this appears no longer the case due to the better fixation and processing of specimens in external surgical pathology departments because of the widespread recognition of the importance of molecular diagnostics as an important part of the patient pathway. Soft-tissue tumours are a heterogeneous group of neoplasms that can occur at virtually any anatomic site. Correct characterisation is critical for effective management and prognostication, but as they display significant morphological and immunohistochemical overlap with each other and with non-mesenchymal neoplasms, molecular genetic analysis is a useful ancillary diagnostic modality. Many soft-tissue neoplasms are associated with recurrent chromosomal translocations leading to characteristic gene fusions, and definitive diagnosis increasingly relies on evidence of characteristic fusion transcripts by reverse transcription-PCR (RT-PCR) in the correct histological and clinical context. Fluorescence in situ hybridisation (FISH) and RT-PCR are routinely used in a complementary manner; RT-PCR is particularly useful as it identifies specific fusion transcripts in contrast to FISH for which commercial break-apart probes are routinely used, which only provide evidence of a gene rearrangement. This is less useful now with the increasing recognition of the diversity of neoplasms associated with certain gene rearrangements such as the promiscuous gene EWSR1, which can partner with a variety of genes to generate several different neoplasms varying in morphology and clinical behaviour.1 ,2 Formalin-fixed, paraffin-embedded (FFPE) samples provide the main source of patient nucleic acids for ancillary molecular investigations in surgical pathology laboratories, but the extraction and amplification of high-quality RNA from these can be challenging due to short-size amplicons resulting from DNA or RNA degradation, particularly in archival samples unsuitably processed for nucleic acid preservation. Formalin is the most widely used laboratory fixative and works by cross-linking proteins and other biomolecules, primarily the residues of the basic amino acid lysine.3 Fixation causes the formation of irreversible cross-linkages between proteins and nucleic acids to preserve cellular structural integrity,3 but also causes molecules to become rigid and susceptible to mechanical shearing, and both the paraffin wax and the cross-linkages can block DNA polymerases, preventing amplification by PCR and compromising the quality of RNA that can be isolated for reverse transcription. In this study, we evaluated the most reliable method of providing FFPE material for optimal RNA yield in tumour samples for RT-PCR through the evolution of our molecular diagnostics service by comparing three consecutive years in which different preparations (incorporating the gradual use of thinner or fewer tissue sections and change from the use of tissue scrolls to tissue sections on glass slides) were used, with the technical success rate of RT-PCR as an ancillary tool in the histopathological diagnosis of soft-tissue neoplasms. All cases of FFPE soft-tissue tumour specimens over a 3-year period from 2011 to 2013 that had undergone RT-PCR were retrieved from the molecular diagnostics database (DW and DG). RT-PCR had been performed to assess for specific or characteristic fusion transcripts of soft-tissue neoplasms (table 1), according to standard or previously described methods.4 ,5 Cases comprised both core biopsy and excision specimens of material biopsied or resected at our centre, and external cases that had been sent for pathological review or second opinion. All diagnoses had been previously made based on morphology and immunohistochemistry by one or both of two specialist soft-tissue pathologists (KT and CF). Three consecutive time periods were assessed; these roughly fell into 1-year periods (January to August 2011 (taken as ‘2011’); August 2011 to May 2012 (taken as ‘2012’); June 2012 to December 2013 (taken as ‘2013’)), in which different preparations were used (5×10 μm scrolls, 5×5 μm sections and 1×10 μm sections, respectively). Cases that were technical fails were then selected, and the details of the preparation of the FFPE material were recorded. The RNA quality for each sample is assessed by analysing amplification of the housekeeping gene beta-2 microglobulin (B2M). RNA amplification with a cycle threshold (CT) <30 indicates acceptable RNA quality (figure 1A, B). Technical fails were regarded as cases in which amplification of B2M RNA showed a CT >30. All other parameters, such as the purification kits used, were kept constant throughout the periods assessed. The details of each technically unsuccessful case were recorded as follows: whether these comprised internally biopsied/resected or referral cases, specimen type (biopsy or larger excision), RT-PCR requested and final histopathological diagnosis. 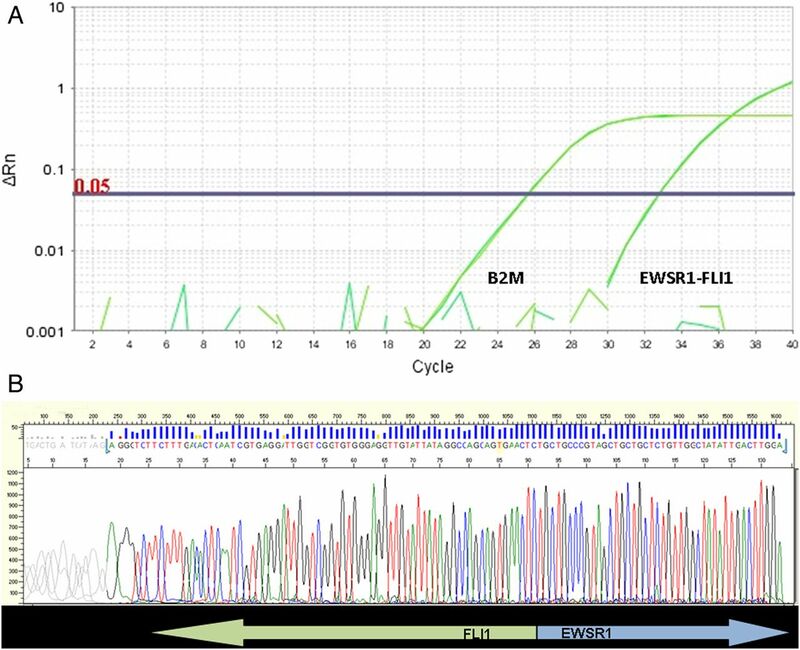 (A and B) Reverse transcription-PCR amplification plots and sequencing, showing positive EWSR1-FLI1 fusion transcripts. Figure (A) Example of a sample positive for the EWSR-FLI1 (type 1) fusion: the amplification curves for both the fusion and the B2M control gene are shown. (B) Sanger sequencing shows the fusion to be between exon 6 of EWSR1 (NM_005243.3) and exon 5 of FLI1 (NM_002017.4). For the time periods ‘2011,’ ‘2012’ and ‘2013’, there were respectively totals of 209, 158 and 203 separate specimens for which molecular requests were made (table 2). Of these, technical failure occurred in 13.4% (n=28/209 specimens), 4.4% (7/158) and 7.9% (16/203), respectively. The percentage of referral cases (ie, those not biopsied or excised at our institution) of these technical fails was 71.4%, 85.7% and 31.3%, and, where sample type was known, the proportion of core biopsy to excision specimen material was 3:15, 2:5 and 13:3, respectively, for these years. For all years, cases that had technically unsuccessful RT-PCR that also had FISH performed from the same FFPE material had a 100% success rate with FISH (ie, hybridisation to tumour nuclei was obtained with an assessable result). Technical fails by year, showing tumour type assessed for by RT-PCR, and corresponding final diagnosis are shown in table 3. No specific pattern of RT-PCR failure according to tumour diagnosis was noted, although myxoid neoplasms were relatively frequently represented in tests that were technically unsuccessful, as well as neoplasms tested for low-grade fibromyxoid sarcoma, implying a group of tumours with prominent fibrous stroma. This study shows that the effectiveness of RNA extraction and purification from FFPE material for RT-PCR as part of the routine ancillary molecular diagnosis of soft-tissue tumours is dependent on both the type of specimen and the sectioning strategy used for RNA extraction. Since the set-up of the ancillary molecular diagnostics service at our tertiary sarcoma centre in 2006, there has been a steady improvement in the technical success rates of cases undergoing RT-PCR to assess for various fusion transcripts characteristic of soft-tissue neoplasms.6 The overall failure rate for FISH and RT-PCR at our institution has been recently reduced to <5%, which reflects a marked improvement from the previous RT-PCR failure rate of 25.2% of cases in 2007–2008.4 The findings from this current study have shown the failure rate for RT-PCR to improve over the recent two years (4.4% and 7.9%, respectively, in 2012 and 2013, compared with 13.4% in 2011). RT-PCR has traditionally been more sensitive than FISH to suboptimal methods of tissue fixation and processing.4 The increase of technical successes certainly seems generally attributable to the gain in experience of both surgical pathology and molecular diagnostics laboratory staff in the optimal preparation of FFPE material for molecular assessment.6 This is likely significantly enhanced by the general improvement in optimising tissue handling and processing (including more standardised procedures for fixation protocols and fixative compositions) by surgical pathology departments because of the understanding of the critical role that molecular diagnostic pathology plays in the patient pathway, in analysing genetic abnormalities in solid tumours with available targeted treatments. This study has, however, shown both improvements and deteriorations in specific settings (figure 2A–D). A marked improvement has been shown for large specimens in the recent years (table 2), which can be attributable to the previously used quantity of tissue (ie, 50 µm in scrolls) containing large amounts of non-microdissected material leading to saturation of RNA extraction columns with paraffin and/or undigested tissue (figure 2A). By contrast, recent technical fails have occurred more frequently in core biopsy material, where the now-used 1×10 µm sections on glass slides can be too small for adequate RNA extraction, particularly when the total cellularity of the specimen is low, and nucleic acids can remain adhered to the slide even when non-charged slides are used, considerably reducing the yield of extracted RNA (figure 2B, C). The number of tumour cells available is dependent on tissue section thickness and can depend on the tissue type. Although it is not possible to form definite conclusions about tumour types that led to technical fails by RT-PCR, myxoid neoplasms were relatively frequently represented (ie, cases tested for the fusion transcripts of myxoid liposarcoma) as well as those tested for low-grade fibromyxoid sarcoma (with final histological interpretations including fibromatosis and sclerosing epithelioid fibrosarcoma, suggesting that these were sclerosing neoplasms with a prominent amount of fibrous stroma). Myxoid or fibrous stroma might therefore lead to difficulty with RNA extraction due to the prominent stromal component present, reducing the overall total density of cells (per µm2 of tissue), and therefore, the total RNA available from the same area of tissue extracted (figure 2B, D). Based on this, we recommend in these cases to select additional sections (ie, 5×10 µm or 10×5 µm) to ensure sufficient RNA can be extracted for RT-PCR analyses. 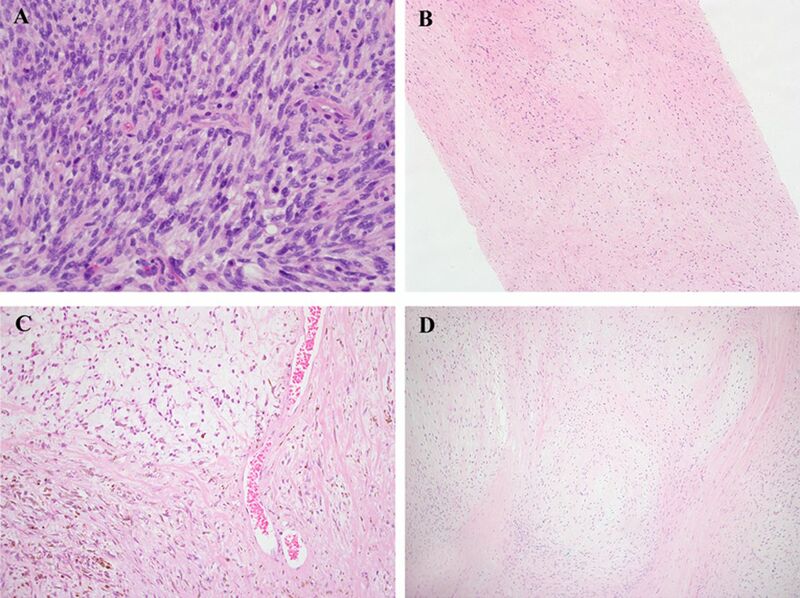 (A) Excision specimen of monophasic synovial sarcoma, showing a cellular neoplasm composed of loose fascicles of uniform spindle cells without significant atypia. While the tumour was shown to harbour SS18-SSX1 fusion transcripts by reverse transcription-PCR (RT-PCR), the quality of the RNA in the specimen was noted to be poor, with a beta 2 microglobulin (B2M) gene cycle threshold (Ct) value of 31.5. This may be attributable to the high cellularity of excision specimens cut as thick 10 μm scrolls causing saturation of RNA extraction columns in the early 2011 specimen cohort. The corresponding fluorescence in situ hybridisation (FISH) test showed a SS18 gene rearrangement. (B) Core biopsy of low-grade fibromyxoid sarcoma (LGFMS). This neoplasm shows typical features of LGFMS, with patternless distributions of cells with bland, ovoid or slightly angulated vesicular nuclei within prominent collagenous stroma. In addition, immunohistochemically it was diffusely positive for MUC4, supporting the diagnosis. While this was an in-house case biopsied at our tertiary centre under optimised conditions of specimen preservation in 2013, RT-PCR was technically unsuccessful, with the Ct value for the B2M control gene higher than the minimum acceptable value of 30. The sparse cellularity of the tumour and the prominent collagenous stroma (which would reduce the overall total cell density per µm2 of tissue and hence the total RNA available) may have contributed to the RT-PCR failure due to the use of thinner/fewer tissue sections for RT-PCR in recent times. (C) Core biopsy of extraskeletal myxoid chondrosarcoma. While TAF15-NR4A3 fusion transcripts were detected by RT-PCR, the RNA quality was suboptimal (Ct value 29.6), and the presence of the TAF15-NR4A3 fusion had to be confirmed by direct sequencing. This was another case biopsied in-house in the 2013 cohort. This neoplasm is also relatively sparsely cellular and has prominent myxoid and in areas fibrous stroma, which is compounded by the small amount of lesional tissue present in the core biopsy specimen, again likely contributing to RT-PCR failure when using thinner/fewer tissue sections in recent times. (D) Excision specimen of low-grade fibromyxoid sarcoma. This tumour specimen from a different patient again shows typical features of LGFMS, with similar bland ovoid cells in alternating myxoid and fibrous stroma. This specimen was also from the 2013 cohort, but despite also containing prominent myxoid and fibrous stroma that could lead to difficulty with RNA extraction (similar to the neoplasm in figure 1B), RT-PCR was successful, likely aided by the presence of a large amount of tissue in this excision specimen. Previous technical fails also occurred mostly in referred cases, in which specimen fixation may have been less optimally regulated than at our tertiary centre, causing RNA degradation.7 However, this now no longer seems to be the case for the recent technical fails, again likely due to the better fixation and processing of specimens in external surgical pathology departments because of the improvement in outside laboratories after the widespread incorporation of molecular diagnostics into the patient pathway.8–11 The findings of successful FISH assessment in 100% of technically unsuccessful RT-PCR cases that had corresponding FISH for all three time periods studied add further support to the RT-PCR fails representing technical issues specific to this process alone. Potential confounding factors were minimised as much as possible in this study. In all time periods assessed, all other parameters in the protocols used, such as the purification kits, cDNA synthesis and RT-PCR protocols, were kept constant. In summary, this study shows the marked improvement in technical success of RT-PCR in FFPE material with advancing time, which is multifactorial and owes significantly to the increasing experience of staff in molecular diagnostics laboratories and of surgical pathology laboratories at both tertiary and referral centres. RNA is purified most effectively from large resection specimens using thinner sections mounted onto glass slides rather than the thick section scrolls that were previously used as this helps in reducing the high-specimen cellularity and wax content from large amounts of tissue that could saturate the extraction and compromise the purification process. Conversely, this approach increases the technical fails in core biopsies due to the low cellularity present within the thinner amounts of sections used, leading to inadequate RNA extraction, suggesting that more sections on glass (eg, 5–10×5 µm) are recommended in core biopsy specimens. As molecular genetic analysis is now a routine ancillary tool in the diagnosis of soft-tissue neoplasms and the final diagnosis is often dependent on the molecular result, it is important that the optimal yield of patient RNA is available from formalin fixed, paraffin-embedded material. This study shows that the effectiveness of RNA extraction and purification is dependent on both the type of specimen and method of preparation. The failure rate has improved over recent years, particularly for large specimens in which multiple thick 10 μm scrolls can saturate RNA extraction columns. However, recent technical fails occur more frequently in core biopsies as 1×10 μm sections are too small for adequate RNA extraction. While previous technical fails occurred mostly in referred cases, this appears no longer the case due to the likely better fixation and processing of specimens in external surgical pathology departments because of the widespread recognition of the importance of molecular diagnostics in the patient pathway. We acknowledge support from the NIHR Royal Marsden/ICR Biomedical Research Centre.
. Fixation and fixatives. In: Bancroft JD, Gamble M, eds. Theory and practice of histological techniques. London: Churchill Livingstone (Elsevier Science Limited) 2002:63–84.
. Detection of the synovial sarcoma translocation t(X;18) (SYT;SSX) in paraffin-embedded tissues using reverse transcriptase-polymerase chain reaction: a reliable and powerful diagnostic tool for pathologists. A molecular analysis of 221 mesenchymal tumors fixed in different fixatives. Hum Pathol 2001;32:105–12.
. Effects of fixative and fixation time on the extraction and polymerase chain reaction amplification of RNA from paraffin-embedded tissue. Comparison of two housekeeping gene mRNA controls. Diagn Mol Pathol 1994;3:148–55. Contributors KT, DG and DW designed the study. KT wrote the manuscript. JL, KT, DW, DG, CF and LT collected, analysed and interpreted the data. KT, JL and DW prepared the images. JL and DW contributed equally to the study.